Minutes after President Obama unveiled his plan for net neutrality yesterday, Republicans leaders like Ted Cruz came out swinging. You can chalk up the backlash to more than just partisan spite; Cruz has taken his share of campaign money from telecom giants. And he's far from the exception. Democrats and Republicans alike received over $8 million from the four major telecom companies and their trade group in the 2014 election alone. For some context, the top five pharmaceutical groups spent only half as much in the same cycle. It's no big surprise that corporations throw their monetary weight around. But it is especially worrying when the FCC is already cozy with the very industry it's supposed to regulate. Who, in turn, is supposed to make sure the FCC does its job? Why, that's your elected officials of the Senate Subcommittee on Communications, Technology, and the Internet and the House Subcommittee on Communications and Technology—almost all of whom have received campaign funds from cable giants. We've collected all the campaign contributions to these politicians from Comcast, Time Warner Cable, Verizon, AT&T, and their trade group the National Cable and Telecommunications Association (NCTA). These are megacorporations with many political interests—including piracy, taxes, privacy, and spectrum allocation to name just a few—so their donations reach a wider pool than just these subcommittee members. But it's hard not to notice patterns, such as the trade group's near-consistent contribution of $10,000 to almost every Republican member of the House subcommittee. Here is exactly how much telecoms gave to the election and reelection campaigns of the politicians tasked with overseeing the FCC. 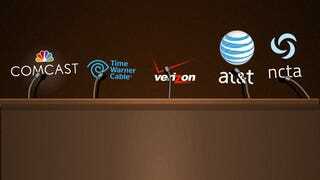 The lone senator on the subcommittee who has not taken money from the telecom industry is Maria Cantwell of Washington. It's probably no coincidence that back in 2011, she introduced a bill to strengthen net neutrality rules. On the other hand, the money trail is always so clear either. Senator Ed Markey of Massachusetts, another vocal supporter of net neutrality, received the most generous contribution from Comcast in the 2014 elections. Yesterday, he called Obama's plan a " game changer." It may be that Comcast's donations were related to other political issues, or it may simply be money can only buy you so much influence with a politician who's made up his mind. Telecom money is greasing many pockets in the House, but it may be worth pointing out Marsha Blackburn of Tennessee, a Republican who has called net neutrality rules "socialistic." She also introduced an amendment to limit the FCC's power to help create community broadband networks that compete with big cable companies. But these numbers don't even paint the whole picture. Corporations can also donate to a candidate's associated leadership Political Action Committee (PAC), whose money the candidate doles out for the campaigns of political allies. Take, for example, the case of Senator Mark Pryor, chairman of the senate subcommittee. In this election cycle, Pryor received $10,000 from Comcast itself. His PAC, called Priority PAC, actually netted another $27,500 from Comcast. But wait—we can keep playing this game—that's not all. The Federal Election Commission also tracks the employer of individuals who contribute to campaigns. This might not seem relevant, until you see that from 2013 to 2014 Pryor received $30,750 from employees of Comcast, all of eight of whom are Comcast executives. In total, Comcast has actually spent $70,650 on Pryor, becoming his second biggest contributor. For his part, the senator has never made a strong stance on net neutrality. If it all seems confusing, yes, that is deliberate. If it all seems like a way to obfuscate exactly how much money is going where, yes, that is deliberate, too. Pryor, by the way, lost his bid for reelection last week. What his loss and the GOP takeover of the Senate will mean for the issues still remains to be seen. But you can bet on plenty of money sloshing around on the Hill. Correction: The charts in this post have been updated to correct for math errors. Note on methodology: Since senators are elected every six years, the Senate chart includes data from 2010, 2012, and 2014 to account for campaign contributions to every member. The House chart includes only the 2014 elections. All data comes from FEC documents collected by the Center for Responsive Politics.